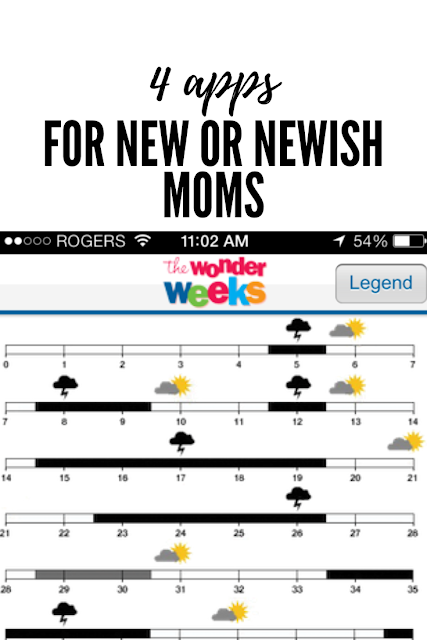 Here is a list of four great apps that I would recommend for new/newish moms. The Wonder Weeks is based on research that there are 10 major mental developmental leaps that your baby will go through during their first year and a half. You enter your baby's due date, and then follow him through his leaps. For each leap, the app will give you a summary of that leap, the abilities your little one may be able to do at the end of that leap, signs that your baby is in a leap (increased fussiness is a big one), and then the best part is that it offers strategies for helping your baby through their leap. I found that S followed these leaps relatively closely, and it was great to learn specific activities or experiences I could do with him to help him get used to his big, new world. This app keeps track of all of the vaccinations your child has had or will need to have in the future. If you turn the location feature on, it will also notify you of any major disease outbreaks in your area. I love finding something awesome for Canadian moms, and this app was created by the Ottawa Hospital Research Institute. The other very useful part of this app is the electronic version of the yellow immunization card (I always forget the paper one at S' checkups). I can email to myself if I need a copy or right to S' daycare. Designed for babies under the age of 1, this app gave me 365+ Gymboree games, activities, and songs to do with my baby based on his age in months. Sometimes it's hard to know what to do for fun with a newborn. I loved that I could make a favourites list of the activities we enjoyed the most, and there are songs with lyrics and music included in this app. *We also have the book Gymboree 1001 Fun Ways to Play: Quick, Easy Activities for Your Baby and Child which has a ton activities for little ones newborn - 5 years old. This is the mother of all white noise apps. You choose your favourite type of white noise (we usually use city rain) and then let it go. We have it running on an old ipod in S' room when he sleeps. There is also a timer feature, but we don't use it. Anything that helps S sleep is a plus in my book, and this app works really well. I know there are a ton of apps for charting breastfeeding, but I never kept track with that much detail. Let me know in the comments if you found one you loved or if you have another other app you think is essential for new mamas.